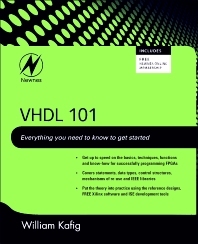 VHDL 101 is written for Electrical Engineers and others wishing to break into FPGA design and assumes a basic knowledge of digital design and some experience with engineering ‘process’. Bill Kafig, industry expert, swiftly brings the reader up to speed on techniques and functions commonly used in VHDL (VHSIC Hardware Description Language) as well as commands and data types. Extensive simple, complete designs accompany the content for maximum comprehension. The book concludes with a section on design re-use, which is of utmost importance to today's engineer who needs to meet a deadline and lower costs per unit. Learn from "best design practices"